Murder by Gaslight: Crime and Criminals. Another Horrible Chapter of Murder and Murderous Affrays. Decatur, Ill. Jan. 29.—On Saturday night Joab Wilkinson took from Decatur to Niantic a jug of whisky, which he distributed to some of his friends. A riot grew out of it, in which three Connihan brothers attacked a Mr. Carson, one of them striking him with a grubbing hoe, breaking his skull. 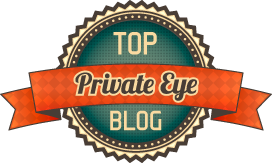 The doctors have trepanned it, and he may recover. Today the parties were committed to await the result. 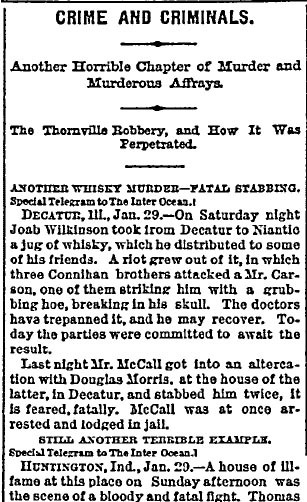 Last night Mr. McCall got into an altercation with Douglas Morris, at the house of the latter, in Decatur, and stabbed him twice, it is feared, fatally. McCall was at once arrested and lodged in jail. Huntington, Ind., Jan. 29.—A house of Ill-fame at this place on Sunday afternoon was the scene of a bloody and fatal fight. 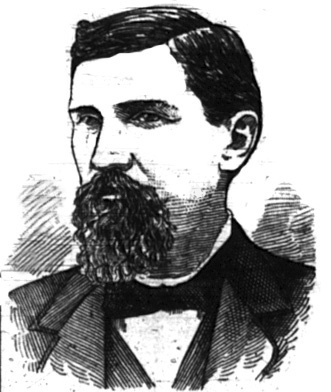 Thomas E. Billings, the keeper, attempted to eject Delatus Shaffer, the clerk of the Hubbell House. Shaffer was intoxicated, and was very noisy, and was abusing the inmates. Finally Billings drew a revolver and shot his assailant, the ball entering the right side and inflicting a wound which will probably prove fatal. Billings was arrested a short time after and taken to Fort Wayne for safe keeping. He has kept a house of ill-fame at that place for several years. St. Louis, Mo., Jan. 29.—A most brutal and unprovoked murder was committed about 1 o’clock this morning at the Comique Theatre, on Vine, between Third and Fourth streets. It appears the William Wiener, the night watchman, and serving as what is called the bouncer, accused Lawrence Mack, assistant bookkeeper of the establishment, with making some disparaging remarks about him to the head barkeeper, which Mack denied. Whereupon the ruffian drew hs revolver and shot Mack in the neck, killing him almost instantly. Mack was a very slight and small man, while Wiener is a great, burly, broad-shouldered bully, and is under bonds for attempting to kill his wife a few weeks ago. St. Louis, Mo., Jan. 29.—The proper name of the young man murdered at the Theater Comique this morning was A. V. Lawrence. He was formerly from Cambridge, Ohio. Weiner, his murdrer, was arrested and placed in jail. Another murder was committed some time last night about seven mils from the city. An old man named John Bishop, 75 years old, well known in that section, had been at the Seven-mile House with some friends during the evening, and at 9 o’clock left for his home, not far away. This morning his dead body was found by the roadside a short distance from the tavern, his head being partly submerged in a little marsh, his pockets turned inside out, and his boots gone. It is supposed that some footpads how have infested that part of the country during the winter suffocated the old man in the marsh and then rifled his pockets and stole his boots. St. Louis, Mo, Jan. 29.—Later information from the country is to the effect that John Bishop, reported murder hear the Seven-mile House, was very drunk when he left the house and circumstances go to show that he fell into a ditch of soft mud and water, and, not being able to get up, was smothered. The rifling of his pockets and stealing of his boots are supposed to have been done buy some negroes who passed along the road and saw that the old man was either dead or helpless. Bloomington, Ind., Jan. 29.—The Rev. G.W. Greer, of Elletsville, this county was shot and dangerously wounded while trying to pacify Chris Smith and Mr. Malicote, who were quarreling, last night. "Crime and Criminals." Daily Inter Ocean 19 Dec 1877.